The charming boy has a heart of gold, and the sprightly, bubbly, family’s apple-of-the-eye girl can conquer anyone – with her tongue lashes and – of course – that syrupy love. Did you say Shah Rukh Khan and Kajol in Dilwale Dulhania Le Jayenge? 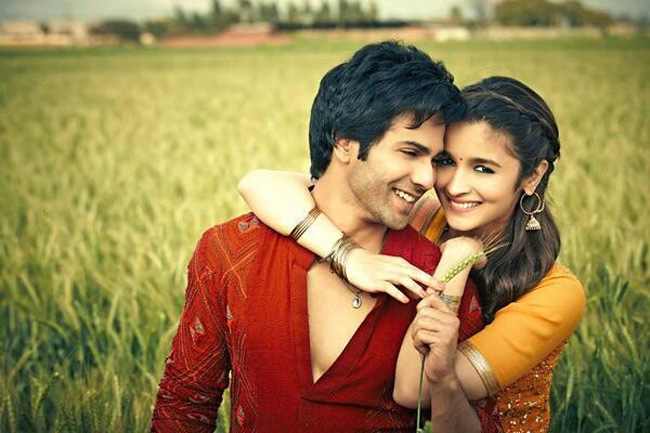 No, this is Varun Dhawan and Alia Bhatt in Humpty Sharma Ki Dulhania. There is very little that is modern about HSKD. Other than the characters flaunting iPads and Dr Dre headphones, director Shashank Khaitan’s tribute to DDLJ gets modern only when it comes to pushing the envelope of physical intimacy. If DDLJ had a sturdy core (given depth by Amrish Puri’s inimitable presence), HSKD has a bunch of stereotypes doing exactly the same thing that they would have done 30 years back in Bollywood. The plot points in HSKD are extremely flimsy. Although born into an extremely rich family, Kavya (Alia) sets out to Delhi to raise money to buy her wedding dress (don’t ask), where she meets Humpty (Varun) as he is shown threatening her uncle to pass him in the exam. You might have thought that Kavya would rush to save his uncle but no, Kavya calls out to the assailants, ‘vanara sena’ (who uses such words other than in serials?) and enters into a deal with Humpty. What follows next? A dance number, but of course. And next will be Humpty helping Kavya in distress. In earlier days, it would have been a few goons pouncing on her, and Humpty rushing to her rescue. But this being a ‘modern’ tale, it is Kavya’s friend’s trouble that Humpty will address. Now that the loyalty of the girl is earned, you have to establish love. Humpty being the loafer has no money but his friends and his dad have hearts of gold. They rush in with all their savings (yes, seriously, because a wedding dress is do or die). Kavya is impressed and suddenly they discover their natural chemistry. HSKD, being modern, they have no qualms about going the pre-nuptial extra mile. Shashank’s Delhi, in which the film is set in the first half, exudes the sense of a small town, and when the movie shifts to Ambala in the second half, the setting gets even smaller – almost like a play. There are no surprises to what happen next. Very low in the emotional and natural intelligence quotient compared to DDLJ, this movie doesn’t even have the heart-warming freshness of a Jab We Met (also with similar nuances). Instead what we get are two up-and-coming stars trying their best to fit into the shoes of their predecessors. Varun Dhawan and Alia Bhatt are naturally gifted but to rise above and shine takes a lot more. While Varun tries too hard to be endearing, Alia needs to stop making faces. Since Highway, her graph has been on the decline as she tries harder and harder to be a Sridevi, Madhuri and Kajol rolled into one. ments. But those aren’t enough to sustain the tempo or interest in a movie that hardly elevates from being a fanboy tribute. What could have been a rib-tickling modern comedy, perhaps even an intelligent DDLJ spoof, turns out to be a pale recycled bin of Bollywood clichés. Tailender: Every week, I realise that Bollywood’s reviewers and yours truly can never meet eye-to-eye. Previous Basheer, Chanthu or Sethumadhavan – who do you recall?